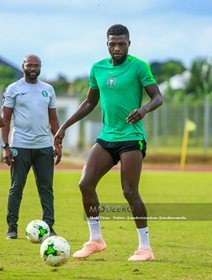 Eleven invited players linked up with the Nigerian National Team at their get-together in Asaba on Tuesday, bringing the total number of players in camp to eighteen, allnigeriasoccer.com reports. The Nigeria Football Federation have confirmed that the latest players to report for international duty are : Ahmed Musa, Paul Onuachu, Effiong Ndifreke, Leon Balogun, Troost-Ekong, Kenneth Omeruo, Abdullahi Shehu, Wilfred Ndidi, Chidozie Awaziem, Moses Simon and Jamilu Collins. Goalkeeper Francis Uzoho, midfielders John Ogu and Oghenekaro Etebo, strikers Henry Onyekuru and Victor Osimhen are the foreign-based players yet to show up in camp. As previously reported by this website, the Nigerian Federation confirmed that the Super Eagles will be having their first training session at the Stephen Keshi Stadium, Asaba on Tuesday afternoon, starting from 1645 hours. Today's workout will be an open session, meaning fans and media will be permitted to watch the team train. The three-time African champions confront Seychelles in a largely-ceremonial Africa Cup of Nations qualifier on Friday, 22nd March, starting from 1600 hours.